From Academy Award winning filmmaker Robert Zemeckis, comes the latest modern interpretation of the classic Charles Dickens tale, A Christmas Carol that transforms the film into a fully feature CGI movie. Needless to say, the results are quite simply spectacular and now another generation of children and adults can experience this timeless tale about the grouchy and rickety Ebeneezer Scrooge (Jim Carey). The Blu-ray version of Disney's A Christmas Carol also includes a DVD copy of the movie and some interesting special features revolving around the movie and the history of the story. Before I go on with the movie, the star of this movie are the computer generated characters which are eerily quite realistic and best of all, the actors who voice these characters even lent some of their likenesses to these virtual people so when you see Bob Cratchit (Gary Oldman) in the film, he actually looks like him as does Jim Carey as the viewer is taken on a journey through the life of Ebeneezer Scrooge. Like Zemeckis' other movies The Polar Express and Beowulf, the actors movements and faces were filmed and then digitally transformed into their A Christmas Carol counterpart and the result is even better than the aforementioned films. The eyes and facial expressions are almost perfect. Plot wise, Zemeckis done well to stick to the original story and the only artistic license that has been used in the movie is the interpretation of the Ghosts of Christmas and of course the journey through Scrooge's life. Having seen the original 3D movie, those "wow" moments are still included on the Blu-ray release and some of the animation is awe-inspiring. It would have been great if Disney released a 3D version of the movie on Blu-ray as well but even so, the format of Blu-ray lends itself well to the 2D version. For those who have never read or seen a film about A Christmas Carol, it revolves around Ebeneezer Scrooge, a man who has cut all ties with humanity in order to procure wealth. As tight as tight could be with money, Scrooge has made no friends in the town where he lives and for some strange reason, he despises Christmas even more than any other day of the year. Of course, something happens to Scrooge and on Christmas Eve, he is visited by the three Ghosts of Christmas who take him on a journey of the past, present and future with a dire warning that if he does not change his ways, a gruesome existence awaits him. Although this film is rated PG, parents need to be mindful of the content of this movie as there are quite a few scary scenes in the movie that may leave younger children, a little frightened at best and with that said, it is recommended for children of 10 and up. 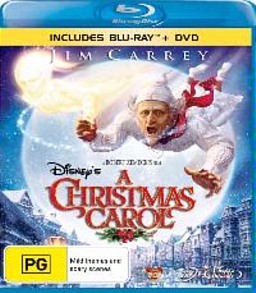 Apart from the wondrous computer graphics, the actors in the movie really get into their roles well and Carey is perfect as Scrooge, without any over the top moments. Oldman is great at Scrooge's accountant, Bob Cratchit and also his ghostly business partner Marley and even Tiny Tim, Bob's son. The movie was perfectly voiced and cast. Other actors include Colin Firth who plays Scrooge's nephew, including some great spot performances by Robin Wright Penn, Cary Elwes and my favourite, Bob Hoskins. The video quality is presented in 1080p HD (2.40:1) and looks amazing on Blu-ray with vibrant colours, sharp images and some surreal imagery thanks to the CGI. Add in a DTS-HD 5.1 soundtrack and it's almost like being at the cinemas but from the comfort of your own home. Both the video and audio compliment the story quite well and it's easy to see how this will become a new modern classic of a classic story. There is also a wealth of special features from an interactive countdown to Christmas feature, behind the scenes featurettes and some interesting deleted scenes. It may not be stocked up like some other Disney movies but the special features are still engaging and fun to watch. In conclusion, A Christmas Carol is an entertaining movie that is a great interpretation of this classic story. The movie is well paced and really uses the CGI technology quite well that will allow most viewers to be easily drawn into this visually impressive and entertaining movie about Ebeneezer Scrooge. My only complaint is that there were a few moments in the movie that seemed to drag on a little but fortunately it found its pace again. Hopefully a 3D version soon?